This customer had a dip in front of their garage from improper back fill when their house was built. Water would lay in this area and with the freezing and thawing over time the pavement began to degrade. We used out concrete/paving saws to cut a nice line in the current pavement. Then dig out the the old degraded pavement. 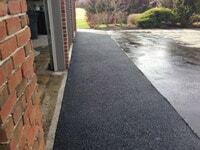 Next we installed a more stable footer base, then installed a smooth transition 3 inches of wearing course blacktop.